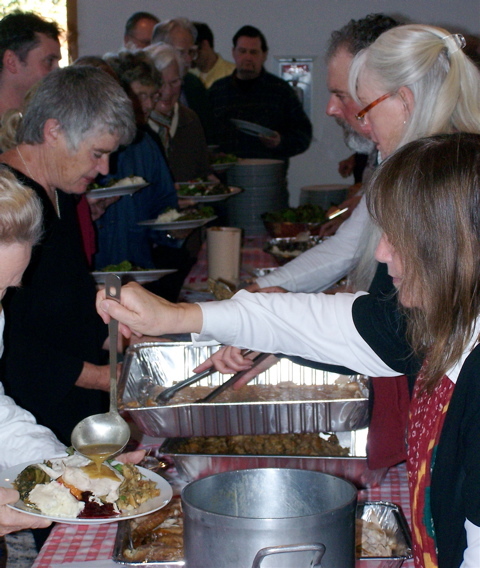 Hundreds of West Marin residents plus a number of visitors enjoyed free turkey dinners (with vegetarian “turkey” available) Thursday in Point Reyes Station’s Dance Palace. The 23rd annual West Marin Community Thanksgiving Dinner, as always, drew community members of all ages and from all walks of life. For many, it was a chance to socialize with friends and neighbors, as well as make new acquaintances. 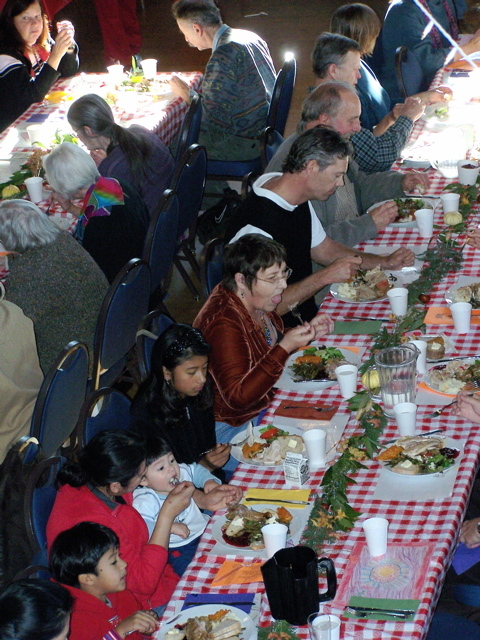 The community dinner for more than a decade was held in Point Reyes Station’s Red Barn (now painted green) and in recent years was held in the gymnasium of West Marin School. One effect of the event’s moving to the Dance Palace Community Center this year was that guests could once again bring wine to enjoy with their dinner. A happy crew of volunteers served the dinner. Here singer/musician Harmony Grisman ladles gravy while writer Elizabeth Whitney gets a helping of stuffing from ornithologist David Wimpfheimer. 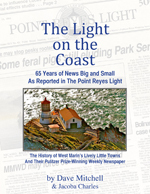 Organizing the annual dinner is West Marin Community Resource Center, working with the Inverness Garden Club, Marin County Fire Department in Point Reyes Station, Sacred Heart Catholic Church, The Dance Palace, West Marin 4-H, West Marin School, and West Marin Senior Services. Marin Organic members provided most of the vegetables for the feast, along with dozens of quarts of Straus Family Creamery yogurt for guests to take home with them. Here’s who helped feed the multitude: Bank of Petaluma, turkeys; Bovine Bakery, bread; Brickmaiden Bread, bread; Clover Stornetta, dairy products; Coast Roast, coffee; Forks & Fingers (Novato), pitchers; rancher Bob Giacomini, Point Reyes Bleu cheese; Lombardi’s (Petaluma), bread; National Park Service, turkeys; Palace Market, potatoes; Rhea McIsaac, produce; Sacred Heart Parish, pies; Gail Coppinger, produce; Peter Martinelli, produce; Station House Café, salad dressing & produce; Waste Management, debris box; West Marin Lions Club, turkeys; Rotary Club, turkeys; Marin Produce (San Rafael), produce; Toby’s Feed Barn, produce; and Star Route Farms, produce. Sparsely Sage and Timely is powered by	WordPress 4.9.10 and delivered to you in 0.547 seconds using 50 queries.